Fartymarty (or anyone else heading out soon), we're counting on you to QA my map and provide us with updated info. Feel free to add to Jim's original data as well. I'm pretty sure that some of these are still wrong. Use at your own risk. Well, since I couldn't get anyone else to QA my map, I had to go out there and do it myself. I did a walk-through in the moonlight last week. I've added a few water faucet locations, the dump station, and corrected sites 27, 29, and 47 to be shown as reserveable. I'd add in the Windows Trail access between sites 49 and 51, but I'm too lazy. The map found on recreation.gov is the most recent one. 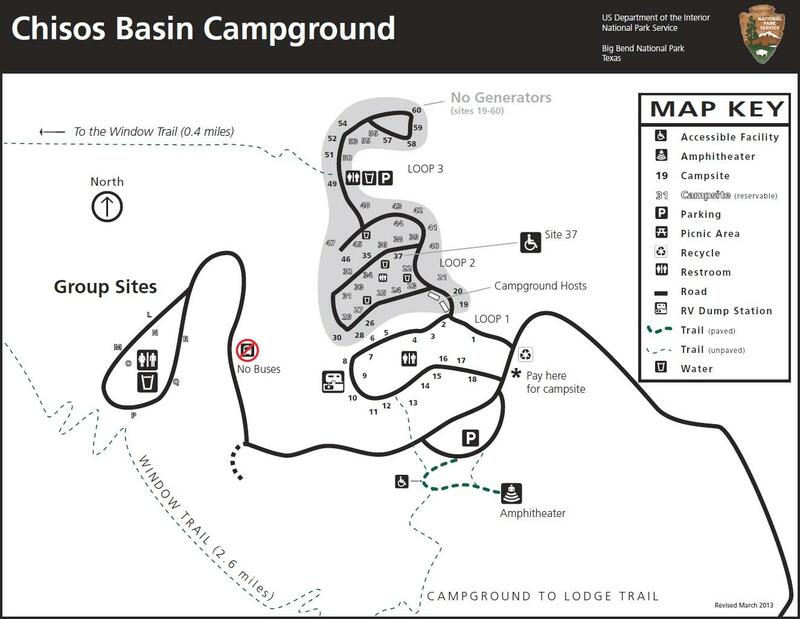 We have not posted a map on our website because the Chisos Basin campground is still being worked on, as far as numbering. There may also be some rerouting of traffic flow, as well as changes in some of the numbers, so our website coordinator is waiting for all this work to be completed before posting a final map. If we hike down into the basin on a Wednesday of Spring Break 2013. (3/13/13). What are the odds that our 2 man group could find a place to sleep and hike out the next day? I just checked and the lodge and the 25 or so reservable sights are booked. I'd say pretty slim. During Spring Break it will be packed to capacity. Your best hope for a campground site will be to get there fairly early in the morning and see if you can catch someone leaving. The campground host does a fairly good job of keeping track of which sites are coming open, so check in with him early and often. There are 60 sites, with 34 of those being "first come, first served". Timing is everything. Richard, Thank you for the information. I am going to guess that there is a good chance that zones near the OML and designated sites in the Chisos may be filled by Saturday, March 9, anyway. I would love to be able to hike from the desert into the mountains, camp at the Basin and dayhike back to the car. However, I am planning three to four back up itineraries for a four-night trip. It may be possible one of the Juniper Flats or Boulder Meadow sites will be open. They're the closest to the Basin. Flexibility when getting your backcountry permits is mandatory during Spring Break. Good luck! Generator use is permitted in designated areas between the hours of 8 a.m. and 8 p.m in the Rio Grande Village campground. Generator hours in the Chisos Basin campground are 8 a.m. - 11 a.m. and 5 p.m. - 8 p.m. Idling vehicle engines are considered generators in this regard. No generators are allowed at Cottonwood Campground. We may have space march 12 to 14. We're making our first trip with a pop up camper. It changes the dynamics so much. I never worried about campsites before when we could tent camp anywhere. Zone, roadside, etc. now I'm worried and hoping. Does anyone know if this site is really #40? Pretty sure that isn't site #40. Based on the map, #40 doesn't face the Window. I'm almost positive that's a picture of site #47.